Get it together with modem/router combos. 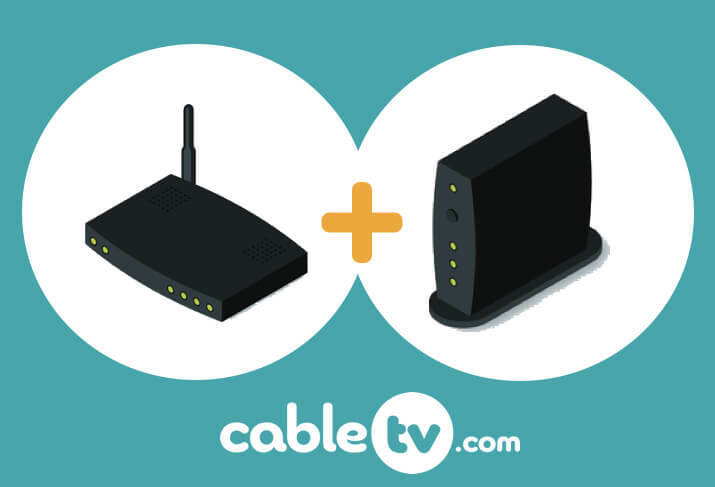 With cable internet, a modem is your connection to the network, and a router makes that connection wireless. If you get these devices separately, staying on top of the newest tech is easier. But there’s a lot less clutter to deal with when you get them in one device. Many ISPs will offer you the convenience of a modem/router for a monthly fee. But if you want to save money (and space), buying your own device will pay off in the long run. Features current as of 12/05/18. Did you know? Modems/routers are designed to support a specific maximum speed. Buying the cheapest equipment that matches your internet plan is a great way to save money. But if your device supports less speed than your plan offers, you won’t get all the speed you’re paying your ISP (Internet Service Provider) for. When you’re on the prowl for the sexiest modem/router out there, check out this fine piece of plastic-encased tech. 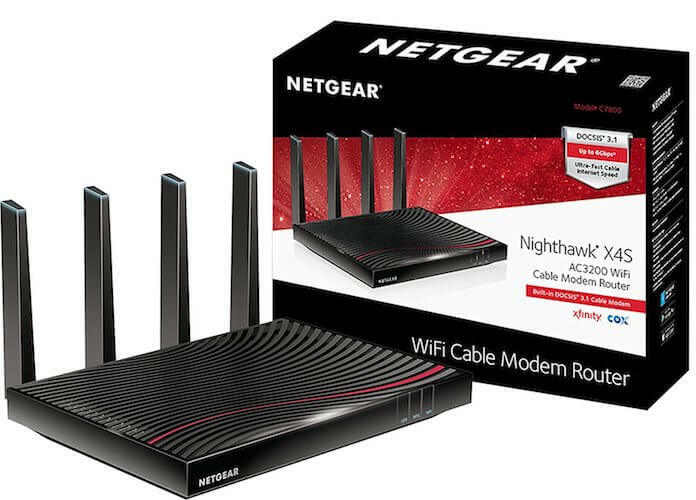 Featuring a red racing stripe and four antennas, NETGEAR did its best to show that this router is as fast and advanced as possible. But with the high price tag, don’t go for this one unless you have gigabit internet speeds or plan to have them soon. 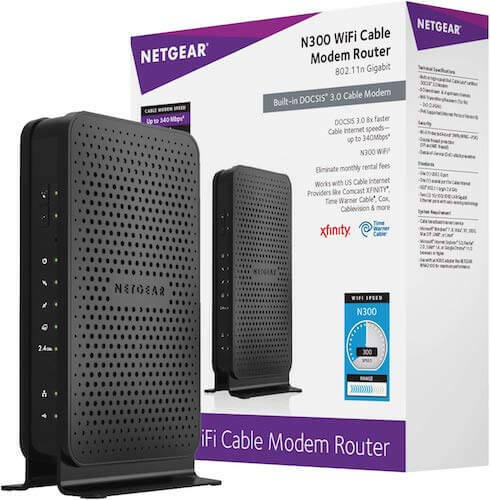 As far as we can tell, it’s the only modem/router combo out there that has DOCSIS 3.1 technology, so choose this one if you want the newest tech in a neat package to go with your blazing internet. 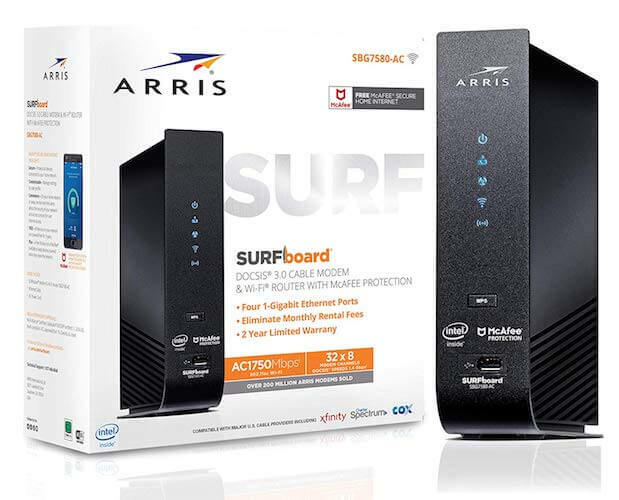 While it doesn’t have fancy DOCSIS 3.1 tech like the NETGEAR Nighthawk X4S, this ARRIS SURFboard will still carry up to 1 GB speeds into and throughout your home. ARRIS sweetens the deal with three years of McAfee protection so you don’t have to stress about viruses. Just because you’re shelling out for fast internet doesn’t mean you have to empty your pockets for a modem/router too. Think of this as a cheaper gig solution that might not be relevant forever but will certainly last long enough to save you from leasing a device from your ISP. Like most NETGEAR Nighthawks, the AC1900 is a slick piece of machinery. Thanks to its twenty-four download channels and a 1.6 GHz processor, it runs smooth and fast for all your streaming and gaming needs. And that textured grate on the exterior adds an extra bit of panache. Grab this combo box to get up to 500 Mbps of unhindered internet access—and look cool while doing it. This Motorola model is an excellent choice for speeds up to 200 Mbps. Unless there’s a major sale going on, it’s usually more affordable than the other options above. The only drawback is that it doesn’t have a USB port, which is a bummer if you need to connect a printer or add extra storage. Go for this modem if you have the matching speeds with your internet plan and don’t have a ton of devices running at once. The modem’s sixteen download channels should be enough for most households, but you may want to go for something stronger if you’re trying to run an entire smart home on it. 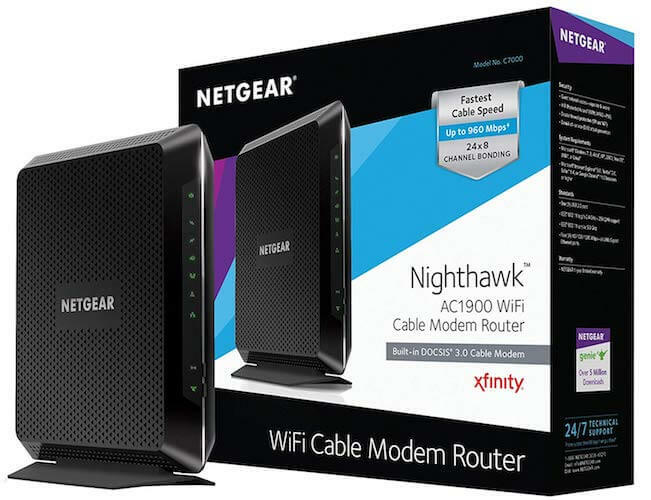 If you want to get some incredible savings on a cable modem/router combo versus your provider’s lease option, this is the way to go. It supports only lower cable speeds and the technology is a little behind the times, but it’s still kicking. This device is the best choice for someone who wants to save, doesn’t have many devices, and has an internet plan with download speeds lower than 100 Mbps. And since this baby pays for itself in less than a year, it’s a good option when you’re just trying out owning your own modem/router. If you’re looking for a cable modem/router combo, it’s probably because you like to simplify. You don’t want two devices when one will do the job. So, why complicate the process with tons of garbled numbers and letters? We get you. It’s time to demystify all the tech specs. When you sign up for internet with your provider, you’ll choose a plan with download speeds that fit your usage style. Buy a modem/router combo that can support those speeds, or you won’t be able to enjoy all the speeds you’re paying for. Not sure how much speed you need? Our buddies over at HighSpeedInternet.com have a tool to help you calculate your ideal internet speed. It takes only a couple of minutes, so we recommend giving it a try. Pro Tip: Sending internet over Wi-Fi can degrade your connection. 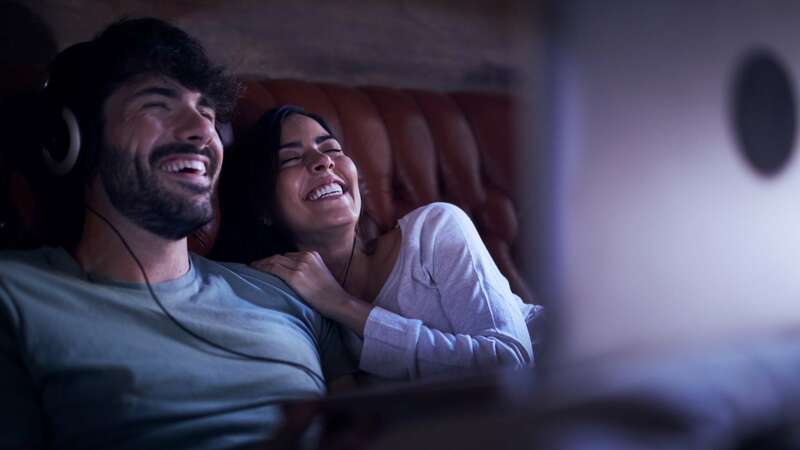 If you want to enjoy smooth wireless streaming and gaming, it’s safest to go for an internet plan that has higher speeds than you think you need. More modem channels mean faster internet. Think of them as lanes on a highway. More lanes mean you can move more cars through an area at the same time. Channels are lanes for information to travel into and out of your home. The naming convention lists download channels first, then upload. 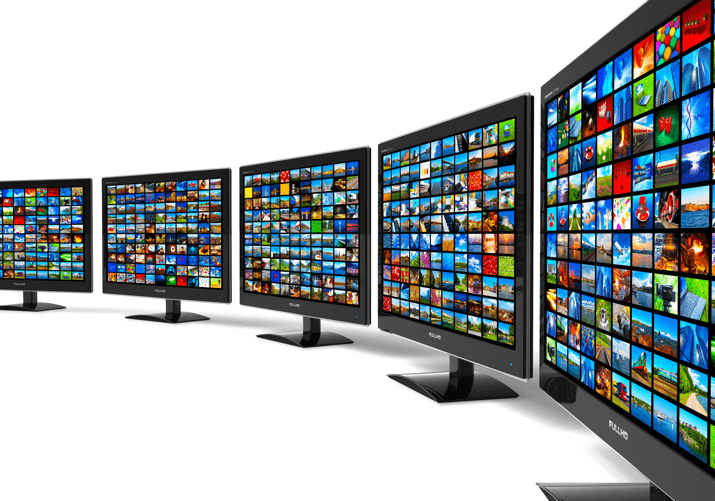 For instance, 16×4 means you have sixteen channels dedicated to downloading and four to uploading. With that setup, you can easily reach download speeds of 200 Mbps. Pro Tip: More channels equal more speed, but it can’t help you access more speed than you’re already paying for with your ISP. You don’t want to pay for more modem than you need. Follow our recommendations by speed above for your best fit. To learn more about what to look for in a modem, check out our cable modem buyers guide. Specs on Wi-Fi performance are one part useful information and one part marketing gibberish. The letters matter: they represent what generation of wireless technology the router uses. The ones in this article were “AC” from “802.11ac,” and “N” from “802.11n.” These standards were popularized in 2012 and 2009 respectively. Both of these types are dual-band, which means they support Wi-Fi connections on 2.4 GHz and 5.0 GHz frequencies. Yeah, more numbers—sorry. Long story short, routers used to work only on a 2.4 GHz frequency, which can slip through the walls of your home and work from a long distance. The problem is that it has just 11 channels, and the connection isn’t as strong. Then 5.0 GHz came along. It has 23 channels, which gives it a superfast connection. Initially, it didn’t have the same range as 2.4 GHz, but 802.11ac tech amplifies the reach of both to about 820 feet. With an 802.11n router, 2.4 GHz will still reach 820 feet, but 5.0 GHz reaches just 460 feet. You can take advantage of this newfound knowledge by connecting your internet-ready devices to the frequency that will best support them. When you’re connecting your devices, both frequencies will have your router name, but the 5.0 GHz network will usually have 5G as part of the title. While the letters in Wi-Fi performance show off the technology your router uses, the numbers are there to be big and make you think one router is better than another. They represent theoretically how much data your router could transfer per second if it were using its max number of channels. For example, an AC1900 router’s maximum bandwidth would be 1,900 Mbps. But it won’t ever reach those speeds outside an optimized laboratory. Out in the real world, there’s no notable difference in performance between AC1750 and AC1900. A router with AC1000 and below has only single-band technology (one 2.4 GHz frequency, no 5.0), so it probably won’t keep up with a high-tech home. Otherwise, don’t worry about these big ol’ numbers. Now your choice is easy. Choosing a modem/router is super easy once you know what to look for. Support the speeds you need, follow the good reviews, and select a style you like. That’s it. It’s a clear-cut process perfectly matched to this simplified, two-in-one device. Which ISPs offer cable internet? Are there any disadvantages to getting a modem/router? 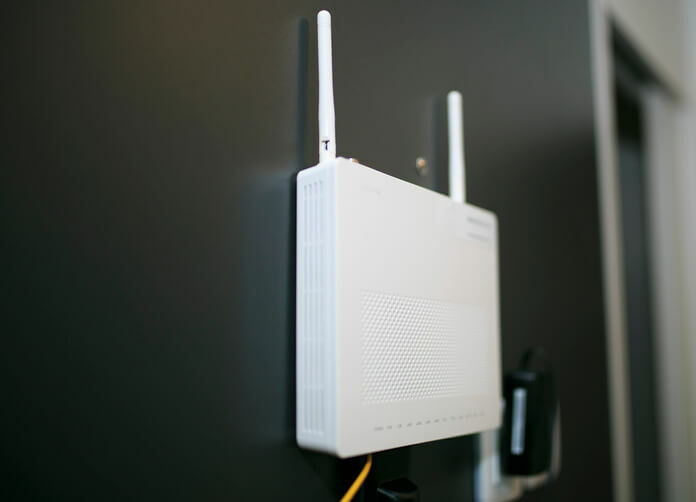 While it’s nice to have two devices in one, having a separate modem and router makes it easier to keep up with leaps in technology because you can upgrade them individually. For example, smart routers are making waves right now, but they’re not available in a combo yet. And the newest modem tech, DOCSIS 3.1, isn’t widely available in combos either. Do I need a special modem for fiber-optic internet? Unlike cable, fiber internet doesn’t use modems—it uses optical network terminals (ONTs). The technology is different, but it serves the same purpose. Unfortunately, it’s hard to find a third-party ONT, so you’ll most likely have to lease the one your fiber ISP (Internet Service Provider) offers.